Whales are an amazing group of animals. They evolved from hoofed animals, like hippos, deer, giraffes, and cows. The fossil record shows us how whales went from being hoofed animals to the aquatic giants we see today. They gradually shortened their arms and legs, lengthened their bodies, and changed their skull shape to be better suited for the water. 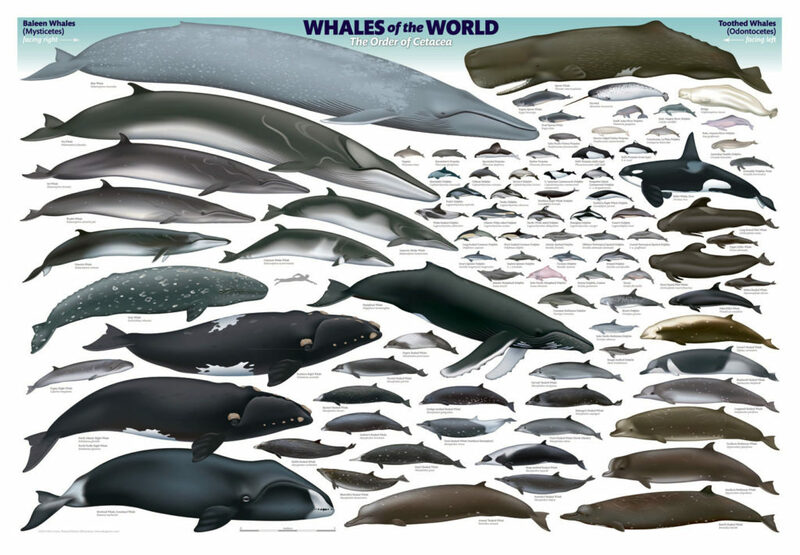 Today, whales come in a variety of shapes, sizes, and colors. The smallest is the Hector’s dolphin at 5 feet long, and the largest is the blue whale at 100 feet long. Whales can be divided into two main groups, based on how they eat. The mysticetes (= baleen whales) have baleen odontocetes (= ‘toothed whales’) have teeth. The mysticetes will gulp and/or lunge feed by taking in a big gulp of water filled with microorganisms (mmmmmm krill). The high frequency sounds travel out into the water, bounce off of any object, and return to the whale. The sound waves enter the whale’s lower jaw, where they are transferred to the middle ear – the hearing organ. These whales can use hearing to ‘see’ their environment! 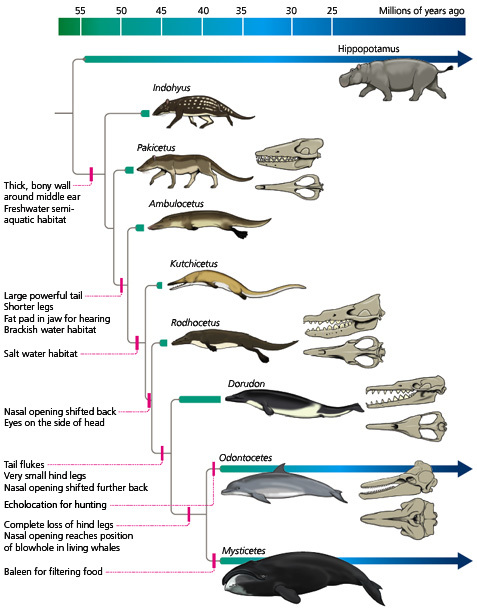 In April (2016) a [paper] was published that described the hearing organ of the earliest odontocete whale from the Oligocene (33-23 million years ago). The shape of the middle ear shows is very similar to that of modern echolocating whales, and it shows that even the earliest odontocetes were using echolocation. Apart from helping them find prey, echolocation allows these whales to communicate with each other, which makes pack hunting and living in big groups easier. Orcas making a big wave to hunt. Echolocation may be what helped these whales become so diverse and successful today! This entry was posted in English and tagged echolocation, odontocetes, Whales. Bookmark the permalink.